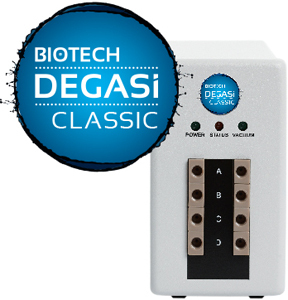 DEGASi Classic is the first choice for most applications in analytical instrumentation and chromatography. This state-of-the-art stand alone degasser will provide you with trouble free and efficient degassing day after day. With the highly permeable Systec AF membrane an internal degasser chamber volume of only 480µl is sufficient to give you excellent degassing efficiency up to flow rates of approximately 3ml/min. The time the liquid spends inside the vacuum chamber is correlated to the degassing efficiency, so with higher flow rate the degassing efficiency will be lowered. In many cases the 480µl vacuum chamber can be used at 5ml/min with sufficient degassing.